Today I want to present you my first premium template. 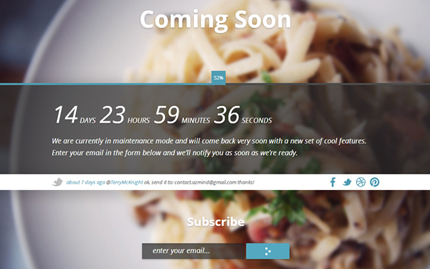 Its name is Genta and is a responsive coming soon page built with Twitter Bootstrap. Genta is a perfect template for creating an under construction page for an upcoming site or product and begin collecting subscribers before the launch. It comes with a fullscreen background slideshow, some nice features (read below) and PSD files for customization. Genta is now for sale on WrapBootstrap for $5. Bought your theme & like it a lot. Twitter feed on your site and mine is not functional in Firefox 17.0.1 (mac) or in Chrome v23+. Works in current v. Safari and Opera. Why? Thanks for buying the template. Let me check this and I’ll get back to you soon. I tested your site on mac (Firefox 17+ and Chrome 23+) and it seems it’s working. Can you send me a screenshot here: contact.azmind@gmail.com? Are you seeing the twitter feed load in FF? It just displays loading … Otherwise ajax sub form and supersize work great. Maybe I have a twitter problem because of discontinuing 3rd party apps like twitter for mac. The problem is in my FF add-ons. Thanks.